Lots of modeler really like the Spitfire. Can't blame them as it is a classic. Used by nearly all the Allied nations in WWII, the Australians particularly liked them and used them during their campaigns in the islands north of Australia. All these planes are painted in Earth Brown/Foliage Green over either Sky or Azure Blue. All have white spinners. First up is Clive Caldwell's Spitfire VIII when he was CO of 80 wing on Morotai in 1945. His plane has a white fuselage band and Sky undersides with black stripes on the spinner. The other Mk VIII is from 457 'Grey Nurse' squadron, also on Morotai in 1945. Like the previous aircraft, it has a white fuselage band and sky undersides. The Spit V is from 70 Sq on Wieiwina Island in 1943. it has a white tail surface and an Azure Blue underside color. There are sections of Dark Earth from its use in North Africa. 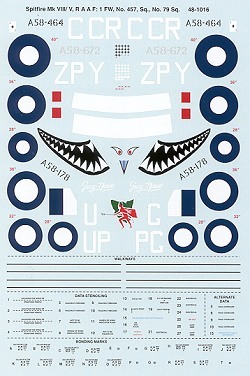 Enough stenciling for one and you can do one MkVIII and the Mk V with the available insignia.